Edmond-Charles Genet (January 8, 1763Template:Spaced ndashJuly 14, 1834), also known as Citizen Genet, was the French ambassador to the United States during the French Revolution. Genet was born in Versailles in 1763. He was the ninth and final child of a French civil servant, Edmond Jacques Genet (September 11, 1726 – September 11, 1781), who was a head clerk in the ministry of foreign affairs. The elder Genet analyzed British naval strength during the Seven Years' War and monitored the progress of the American Revolutionary War. Genet was a prodigy who could read French, English, Italian, Latin, Swedish, and German by the age of 12. At 18, Genet was appointed court translator, and in 1788 he was sent to the French embassy in Saint Petersburg. Over time, Genet became disenchanted with the ancien régime, learning to despise not just the French monarchy but all monarchical systems, including Tsarist Russia under Catherine the Great. In 1792, Catherine declared Genet persona non grata, calling his presence "not only superfluous but even intolerable." The same year, the Girondists rose to power in France and appointed Genet to the post of minister to the United States. President's House, Philadelphia. 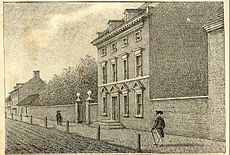 Washington confronted Genet in the presidential mansion in Philadelphia, then the national capital. The Citizen Genêt affair began in 1793 when he was dispatched to the United States to promote American support for France's wars with Spain and Britain. Genêt arrived in Charleston, South Carolina on the French frigate Embuscade on April 8. Instead of traveling to the then-capital of Philadelphia to present himself to U.S. President George Washington for accreditation, Genêt stayed in South Carolina. There he was greeted with enthusiasm by the people of Charleston, who threw a string of parties in his honor. Genêt's goals in South Carolina were to recruit and arm American privateers who would join French expeditions against the British. He commissioned four privateering ships in total, including the Republicaine, the Anti-George, the Sans-Culotte, and the Citizen Genêt. Working with French consul Michel Ange Bernard Mangourit, Genêt organized American volunteers to fight Britain's Spanish allies in Florida. After raising a militia, Genêt set sail toward Philadelphia, stopping along the way to marshal support for the French cause and arriving on May 18. He encouraged Democratic-Republican societies, but President Washington denounced them and they quickly withered away. His actions endangered American neutrality in the war between France and Britain, which Washington had pointedly declared in his Neutrality Proclamation of April 22. When Genêt met with Washington, he asked for what amounted to a suspension of American neutrality. When turned down by Secretary of State Thomas Jefferson and informed that his actions were unacceptable, Genêt protested. Meanwhile, Genet's privateers were capturing British ships, and his militia was preparing to move against the Spanish. Genêt continued to defy the wishes of the United States government, capturing British ships and rearming them as privateers. Washington sent Genet an 8,000-word letter of complaint on Jefferson's and Hamilton's advice – one of the few situations in which the Federalist Alexander Hamilton and the Republican Jefferson agreed. Genet replied obstinately. President Washington and his Cabinet then demanded that France recall Genet as its Ambassador. The Jacobins, having taken power in France by January 1794, sent an arrest notice which asked Genet to come back to France. Genet, knowing that he would likely be sent to the guillotine, asked Washington for asylum. It was Hamilton – Genet's fiercest opponent in the cabinet – who convinced Washington to grant him safe haven in the United States. Genet moved to New York State and married Cornelia Clinton in 1794, the daughter of New York Governor George Clinton. Their son was Henry J. Genet (1800–1872), a member of the State Assembly in 1832. Cornelia died in 1810, and on July 31, 1814, Genet married Martha Brandon Osgood, the daughter of Samuel Osgood, the United States' first Postmaster General. Genet lived on a farm he called Prospect Hill located in East Greenbush, New York overlooking the Hudson River. Living the life of a gentleman farmer, he wrote a book about inventions. He died on July 14, 1834 and is buried in the churchyard behind the Greenbush Reformed Church, about two miles east of his farm. Aglaé-Louise Auguié (1782-1854), wife of Marshal Ney of France, and Genet's niece. Ammon, Harry. The Genet Mission. New York: W.W. Norton, 1971. Childs, Frances Sergeant. French Refugee Life in the United States, 1790–1800: An American Chapter of the French Revolution Baltimore: Johns Hopkins Press, 1940. Link, Eugene Perry. Democratic-Republican Societies, 1790–1800. New York: Columbia University Press, 1942. Sheridan, Eugene R. "The Recall of Edmond Charles Genet: A Study in Transatlantic Politics and Diplomacy". Diplomatic History, Vol. 18 (Fall 1994), 463-68. Thomas, Charles Marion. American Neutrality in 1793: A Study in Cabinet Government. New York: Columbia University Press, 1931. Unger, Harlow Giles. The French War Against America: How a Trusted Ally Betrayed Washington and the Founding Fathers. Hoboken, N.J.: John Wiley & Sons, Inc., 2005. Information about Citizen Genet can be found in the Genet Family Papers, which contains manuscripts, letters, correspondences, compilations, circulars, and photographs related to Edmond Charles Genet and his diverse career as diplomat, inventor, farmer, and correspondent with the leaders of American government, society, and scientific thought, in the Albany Institute of History & Art Library. This page was last modified on 12 November 2015, at 10:56.